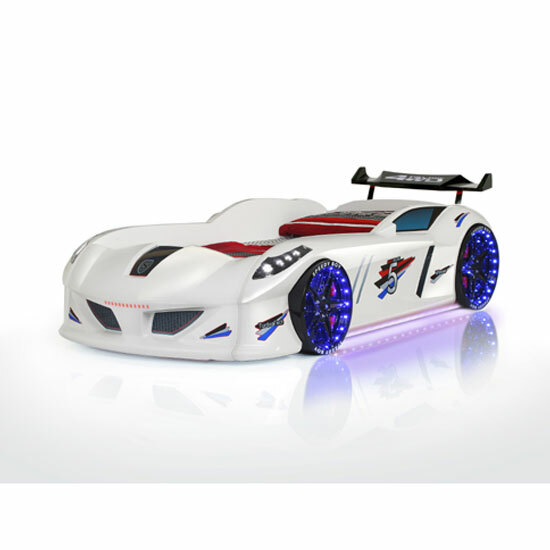 If you are looking for the most stylish and impressive way to decorate your little boy’s room, you should definitely give car beds with lights some thought. Of all children’s furniture models, these beds are definitely the most impressive ones. Most of such beds will have a racing car or a sports car design, even though it will be possible to find a couple of other models, too. And, when it comes to lighting, there will also be several thematic areas to be highlighted. Each of the following options can be presented separately, and there will also be different combinations of lighting areas, described below. This is one of the most logical parts of a car bed that is almost always highlighted. Common colors are the same the real headlights have — either bright white or slightly bluish light. So, you will also have a chance to play with your room color palette. Some models that feature LED headlights will also have wheel lighting. The shade will normally be the same, even though some variations are also possible. Plus, some car beds with lights will have a light shade that matches the body — red, green, yellow, etc. Some car beds with lights will not have stylishly highlighted wheels and headlights, but they will compensate for that with a base lighting. It will create a slightly futuristic glow under the car, serving both as a decorative element and a nightlight. Speaking of decorative elements, you might want to check out a couple of models that have fancy LED stripes in the body of the car. Sometimes, these stripes can be even, and sometimes they will feature abstract designs — flames, logos, etc. Finally, not all car beds with lights have only one LED shade — sometimes, it is possible to find models that feature up to five different LED hues in one bed. This is a fantastic idea if you want some variety. Also, note that car beds with lights will cost you a little bit more than car beds without lights. So, if you are looking for affordable models, you will have two options — either to look for a car bed model without any lighting or to shop in stores that offer more reasonable pricing policy (or more generous discounts) than the majority of platforms. If you live in the UK, you might want to give Furniture in Fashion a try. This is one of the biggest e-commerce platforms in the country, offering up to 75% discounts during seasonal sales. One of such clearances is happening right now. Plus, even if you check out a couple of non-discounted models, you will still notice that most of the price tags are quite moderate. Another important perk of shopping with his company is that it is a local store that ensures quick delivery to any part of the country. Small beds will be delivered to you within three business days maximum, and slightly bigger models — within five business days.